June 1 (Wed) through September 30 (Fri), 2016. The Competition holds the First, Second, Third, and Final Rounds for approximately fifty contestants who passed the Preliminary Screening based on the submitted recording and document. 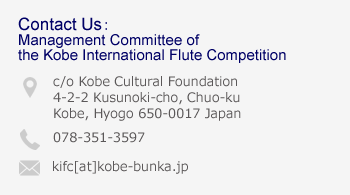 E-mail: kifc[AT]kobe-bunka.jp*Please replace “[AT]” with “@” . Copyrights © 2016, Kobe International Flute Competition. All Rights Reserved.